Welcome to the St. Marys River BPAC Website! The St. Marys River Bi-National Public Advisory Council (BPAC) was created on November 13, 1988. It is a stakeholder’s group, and members include citizens, property owners, tribes, elected officials, health units, municipal staff, and university staff from both Canada and the United States. BPAC was formed to assist government agencies that are responsible for preparing a Remedial Action Plan (RAP) for the St. Marys River Area of Concern (AOC). Specifically, BPAC informs the agencies about public views and opinions regarding the clean-up of the St. Marys River AOC and advocates for projects that achieve the restoration goals. BPAC is dedicated to ensuring that the river water quality and the ecosystem are improved and protected for all users of the river. Where is the St. Marys River? 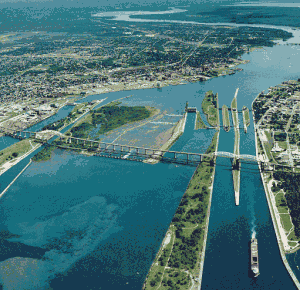 The St. Marys River is a 125 kilometre stretch of water that originates in Whitefish Bay on Lake Superior between Point Iroquois, Michigan and Gros Cap, Ontario and divides into two channels around St. Joseph Island to the east. The North Channel, or St. Joseph Channel, extends to Bruce Mines; the southern or Neebish Channel is the up bound shipping channel and extends to the De Tour Passage where it emerges into Lake Huron.